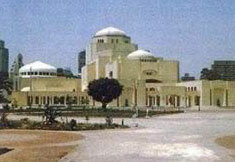 1.The Main Theater, a closed hall comprising 1200 seats, is used for opera, ballet, and classic music performance. 2.The Second Theater is also a closed hall comprising 500 seats and is used for various purposes, including film festivals and conferences. 3.The Third Theater is open and comprises 1000 seats. There are other halls, some of which are used for training and rehearsals. In addition, the Museum and the Library contain references pertaining to the most significant artistic works. theater, is a magical experience. At El-Ghuriya, in the heart of Islamic Cairo, you can watch folk musicians and whirling dervish dancers. And don't forget the most essential after-dark experience, the sound and light show at the Pyramids, a dramatic fusion of light and music recounting the story of antiquity.